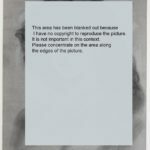 Ensuring all processes are reversible so that the picture can easily be unframed if needed. 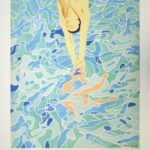 As a paper conservator, I came across so many artworks on paper which had suffered through framing with materials that had damaged them over time. For example, ordinary mountboard is made from wood pulp, which is acidic. 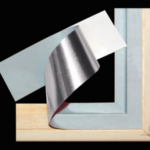 Even if the cover papers of the mountboard are acid free, the acid will cause a discoloured line all around the edges of the window of the mount because these edges open the way for the acid to migrate easily into the picture. Moreover, when paper made from wood pulp ages, it becomes more acidic. 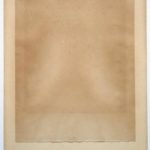 This acid migrates from the mount via the cover paper into the whole substrate of the artwork, discolouring it to brown. This is a watercolour in its old mount. The watercolour outside the mount. 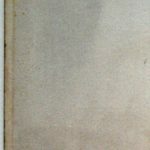 A brown line going along all four edges is caused by acid migration from the window mount into the paper of the artwork. Please see the detailed image on the next page. Detail of the top left corner of the watercolour. The brown line where the acid from the window mount entered and discoloured the substrate is clearly visible. A charcoal drawing in an old mount made from ordinary and acidic mountboard. Visible at the edges of the bevel cut of the window: The core of the window mount has turned brown and more acidic during aging. The outside of the mount has also darkened. The same drawing outside its mount. In this image, you can see a light line inside the left and bottom edges of the work. This line can be seen on all sides. It was created by the acid seeping out of the bevel edge of the mountboard. Acid has migrated from the window mount into the paper of the drawing. The following images show the damage of acid migrating from a backing board into the whole sheet of a picture, in this case a print. A print in an old mount with its backing board. The paper of the art work is discoloured and has turned brown. 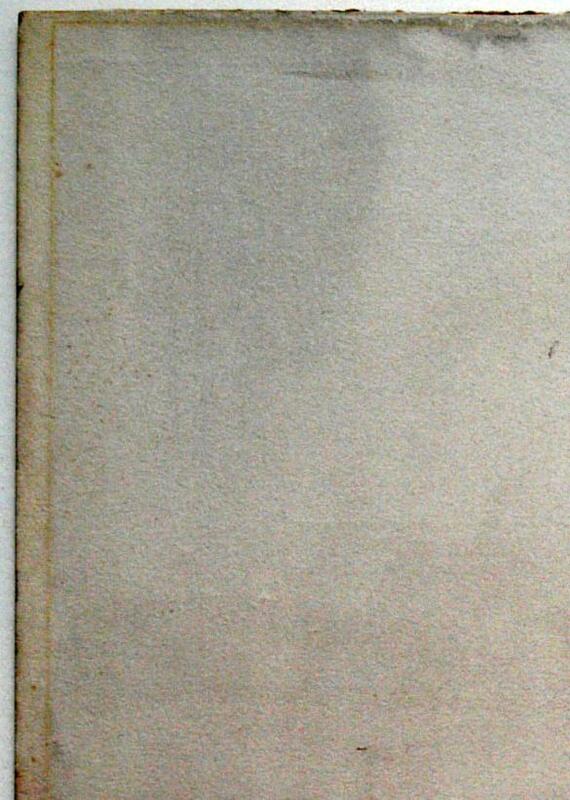 On the right hand side you see the inside of the backing board which is discoloured in its entirety. The back of the framed print. The outside of the acidic backing board has turned brown. Verso of the print. The acid of the old backing board has migrated into the paper of the print and turned it brown. The paper is particularly dark along the edge of the window mount where it discoloured the picture from the front. 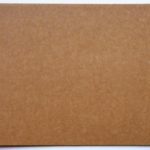 There are four types of mountboard that are offered by manufacturers. Archival-quality Museum Boards are made from 100% pure cotton fibres. Cotton does not contain any acid. 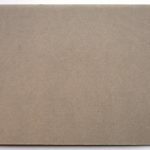 Therefore, if this type of 100% cotton mountboard is used, there will be no problems with discolouration or foxing, (brown spots) caused by mounting boards. Moreover, it is safe to use for mounting traditional photographs. However, alpha cellulose is wood pulp. As paper becomes more acidic as it ages, it is only a question of time until they may become acidic enough to cause damage. Traditional photographs should be mounted on un-buffered boards. However, they are made from wood pulp which may cause discolouration over time. The quotations are taken from the website: http://www.daler-rowney.com/en/content/mountboards which gives a good overview over the different types of mountboard. 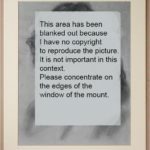 An artwork on paper should not be attached to the window mount but to the backing board of the mount because they can be caught in the window opening and be damaged. One long strip of paper along the top edge of the picture because paper expands and contracts according to the humidity in the room. 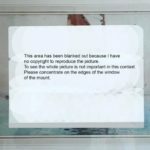 Therefore, this way of mounting can lead to stresses between the work and the adhesive strip and can cause cockling of the artwork. Masking tape, Sellotape or similar general adhesive tapes. Over time the adhesive dries out and the paper of the tape becomes detached. The adhesive migrates into the paper until it appears on the front as brown staining. 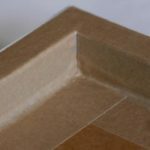 Moreover, the adhesive is extremely difficult to remove as it seeps into the paper and bonds with its fibres. 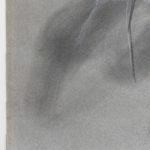 It is far better to use either dedicated gummed hinging tapes or mounting corners for photographs, or Abaca.sa paper hinging tape for giclee prints (digital prints). Traditional photographs are safer mounted using mounting corners or mounting strips. 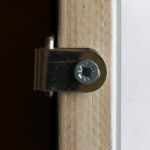 They are also an alternative to paper hinges. 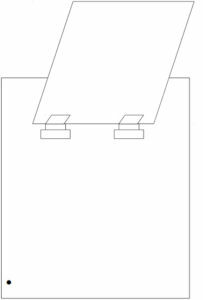 Should paper hinges be used, the company Lineco offers archival grade gummed hinging papers and mounting corners for all cases. Neschen also offers hinging tapes but they are self adhesive and may not be so easily removable if needed at a later date. You can also use any paper strip as long as it is thinner than the work of art you are mounting and as long as it does not contain any wood fibres. The hinges need to be thinner than the picture because if the framed work falls off the wall, the hinges break and not the artwork. If the hinges are stronger than the artwork, it may tear off underneath the hinges and get damaged. 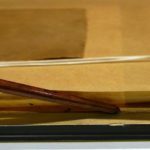 If you use your own hinging paper, Japanese paper is excellent because the paper fibres are very long and give stability to the hinges. In the section Materials and Suppliers you will find listed all the Lineco hinging tapes and their different usages as well as mounting corners and mounting strips. 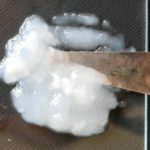 As adhesive, a mixture of methyl cellulose and water, wheat starch and water or rice starch and water are best used because these adhesives are acid free, strong, and can easily be removed with water. The wheat starch that is used as an adhesive for paper is the same that you use for cooking. It is readily available in food stores and cheap in price. It is a is stronger adhesive than methyl cellulose or rice starch which is similar to wheat starch, but lighter and thinner after cooking. 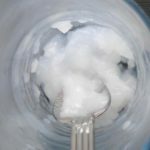 However, wheat and rice starch adhesive only last for a few days in the fridge, whereas methyl cellulose adhesive lasts several months before it goes off. 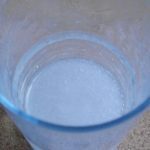 Place 1 flat teaspoon of wheat starch in a medium size glass as the starch will boil high when microwaved. 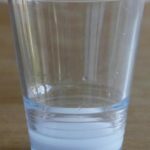 Add 5 teaspoons of distilled or de-ionised water (if possible, otherwise use still table water or cold boiled tap water). 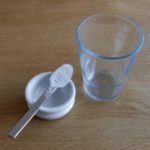 You may experience that you need 6 teaspoons of water if the paste boils too dry with 5 teaspoons. 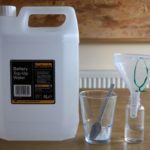 Battery top-up water has been filled into a small container to make it easier to measure the teaspoons of water. Stir the mixture. Place the mixture in a microwave oven. Microwave on a high setting (800) for 10 seconds. It needs to boil. 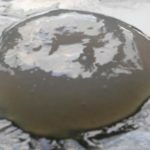 If it has not boiled after 10 seconds, remove the paste, and stir. Place it back in the unit and microwave it another 5-10 seconds or as long as it needs to boil. Wheat starch mixture after boiling. 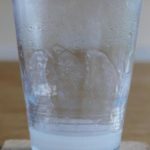 You can see how high it boiled in the microwave. Let the wheat starch adhesive cool to room temperature. However, it may then be quite stiff. 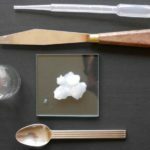 Put a small amount (as much as you need) onto a small pane of glass (or the corner of a larger pane), add a small amount of (best) distilled water to it either with a pipette, brush or tea spoon. Wheat starch paste with a little water added. Mix wheat starch and water in a beating action with a palette knife or the flat side of a knife until the lumps are gone, and the paste becomes smooth. The consistency should resemble mayonnaise. 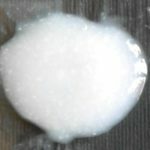 Wheat starch adhesive ready for use. Please apply it to the hinges with a flat brush. 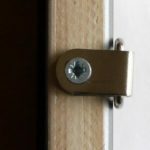 There are various options for hinging but the two most commonly used ones are T-hinges and invisible hinges. Apply a small amount to that part of your paper hinge that is pasted to the work of art. Paste the hinges slightly inside the top edge of the picture. You need two hinges for smaller works and more for larger pictures. Apply some pressure with your finger and let it dry. It is best to paste the adhesive firstly to the artwork and let it dry before the hinges are pasted to the backing board of the window mount. Please do not attach the picture to the window mount itself as it can be caught in the opening and be damaged. For T-hinges, paste a strip of hinging tape across the tape that holds the artwork. 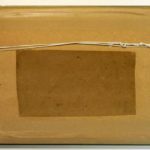 For invisible hinges: fold hinges, which hold the artwork, backwards and secure with a cross tape directly beneath the edge of the artwork. This type of hinge is used for example in collections (museums, galleries) where works on paper are presented in a mount which can be opened in order to examine the work recto and verso. It can also be used for float mounting. 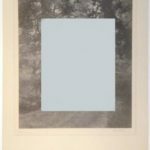 A float mount does not overlap the edges of a picture but instead shows the whole sheet of paper in its entirety. Usually, there is a small gap between the edge of the window and the artwork. Therefore invisible hinges are used. Often it is enough to use the type of invisible hinges shown above for the top of the work and two invisible hinges at the bottom but without the horizontal bar. 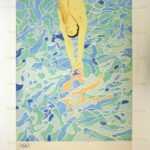 However, if the paper of an artwork to be float mounted is rather thin, the paper may cockle with time. (See below left.) To avoid cockling, one can add several hinges along the edges of the artwork. Then a window which is one or two millimetre smaller than the artwork is cut into the backing board of the mount with a bevel cut. Put the picture face down and the large part of the backing board with the open window on top. The bevelled side faces up and away from the artwork. The hinges are pasted on to the back of this window mount. The inside of the window is put in place and sealed and secured with hinging paper. The poster fixed on the backing board of the mount. The hinges are invisible. The work is ready for float mounting. The same care to protect works of art from acid when mounting should also be applied when framing them. In order to stop acid migrating from the inner side of the frame (rebate) into the mount, you can seal the rebate. This can be done by painting it with oil based primer. Water based primer is not a barrier to acid as the acid in wood is water-soluble. Alternatively, you can stick a self-adhesive frame sealing tape along the rebate. 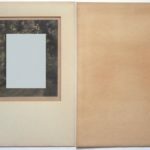 It has two layers: the one that adheres to the frame is made from aluminium, whereas the layer facing the picture is made from paper. The image, right, shows the characteristics of the tape. Here the whole back of the frame is covered by it. If you use glass you only need to seal the rebate because the glass protects against acid migration from the front of the frame. There are different choices of glass for your frame. Already ordinary float glass protects the artwork to some degree from the damaging effects of the UV rays in light. If using ordinary glass, the picture should, if possible, not hang in direct sunlight because, as we all know, daylight, in particular bright sunlight, bleaches out colours and even black ink, and darkens paper. There are different makes of UV protection glass available; museum glass contains also an anti-reflective coating like that used for spectacles which makes the glass almost invisible. Another option is UV-protective acrylic glass. These UV-protective glasses filter out over 90% of the UV rays. 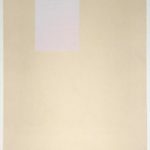 However, their surface is static and may lift the top layer of pastel and charcoal drawings on to the glass. Both boards are made from triple layered corrugated cardboard which is 2.9mm thick. According to the information on the website of Wessex Pictures, they are made from recycled materials and buffered with calcium carbonate to stay alkaline for a very long time. The brown side faces to the back of the frame whereas the grey side faces the artwork. The boards curve slightly inwards to keep the artwork flat in the frame. In addition, ‘Art-Bak®-AQUA’ contains a moisture barring membrane. If the board gets moist, it bulges outwards away from the artwork thus keeping it dry. The board becomes flat again when it dries out. I have experienced this phenomenon with pictures exhibited on damp walls. Art-Bak®-AQUA’: inside of the board. This side faces the artwork. 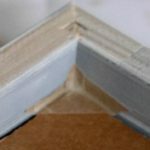 If you use traditional boards like MDF, please be aware that these frame backing boards are acidic. You can seal the board on the inside to stop acid migrating from it into the back mount and ultimately into the artwork by painting the board on the inside with oil based primer, or put a sheet of kitchen aluminium foil on the inside, or a sheet of , Melinex® or Mylar® polyester films. Once the frame backing board is in place, the easiest way to fix it is by special tabs which are ‘shot’ into the rebate with a tab driver. There are different tab drivers on the market. Please see in the section Materials and Suppliers. It is recommended to use only Rigid Tabs but I use Flexi Tabs for small and medium size frames and, when framing larger pictures, combine them with Rigid Tabs. 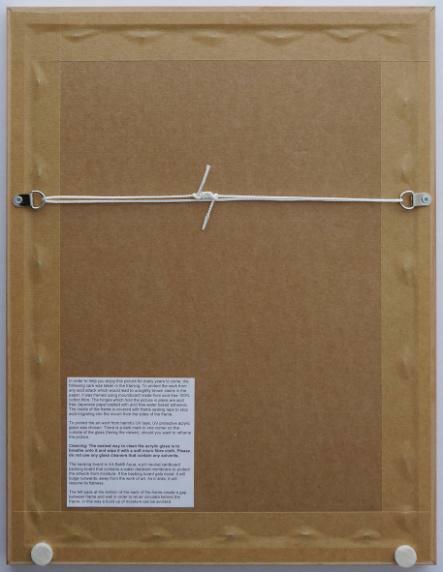 Flexi tabs can be bent so that the work can easily be unframed if needed. 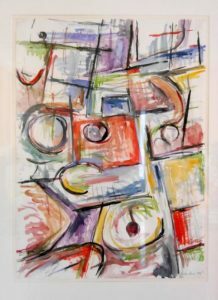 However, although they are strong enough for small and medium size pictures, rigid tabs are necessary for framing larger works in order to stop the back of the frame from falling out. If you open and close a frame a few times, please check that the flexi tabs are still rigid enough to hold, or replace them if necessary. and the tape has become loose. 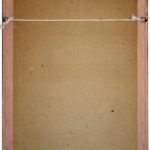 If the back of the frame is painted or varnished, gummed tape may not adhere to it. In that case, self-adhesive brown craft frame backing tape can be used. If you can’t find it with your supplier, it can be found on ebay (Please see the section Materials and Suppliers below). As the tape is situated outside the backing board of the frame, it is far away from the artwork and cannot damage it. Therefore I am of the opinion that it is safe to use them. Tapes come in different widths: 25 mm, 38 mm or 50 mm. Please do not use the self-adhesive tape from ‘Tesa’. It become rock-hard after a few months to a year and will be very difficult, if not impossible, to remove. I contacted ‘Tesa’ (in Germany) about it and they confirmed the fact that it hardens completely with time, saying that it is a masking tape for spraying cars and only designed for short term usage. In order to make sure that the back of the frame is sealed tightly enough to stop tiny insects like thunder flies from entering, triangular pieces of framing tape can be placed in the corners of the frame covering the gap between the backing board and the frame before the framing tape is added to seal the edges. 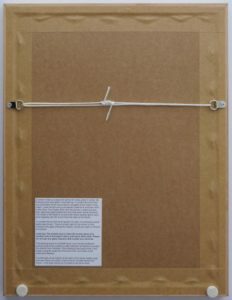 The image, left, shows the finished back of a frame including the string on D-rings and two felt frame bumpers pasted at the bottom of the frame. D-rings are a strong and flat way to attach the string to the back of the frame. In the example, left, the string sits too low. A good height is ¼ of the length of the frame measured from the top. The picture below left shows a D-ring positioned in such a way on the frame that it can be swivelled outwards and does not overlap the inner edge of the frame. Now the picture can be unframed without removing the D-rings. The image below right shows the D-ring in position for attaching the string and hanging the picture. I use a loop of string and knot the ends together with a reef-knot because it is very secure. Reef knot: right over left, left over right. In this way you only have one knot that you can move off centre for hanging the picture and which will be invisible once the picture hangs on the wall. In order to let air circulate and avoid moisture build-up behind the frame, felt frame bumpers should be pasted to the bottom of the frame. Bumpers are available in two sizes: of 2 mm thickness for small to medium size pictures and 3 mm for large ones. If you place them 2-3 cm inwards, they are not visible from the side once the picture is hanging on the wall. 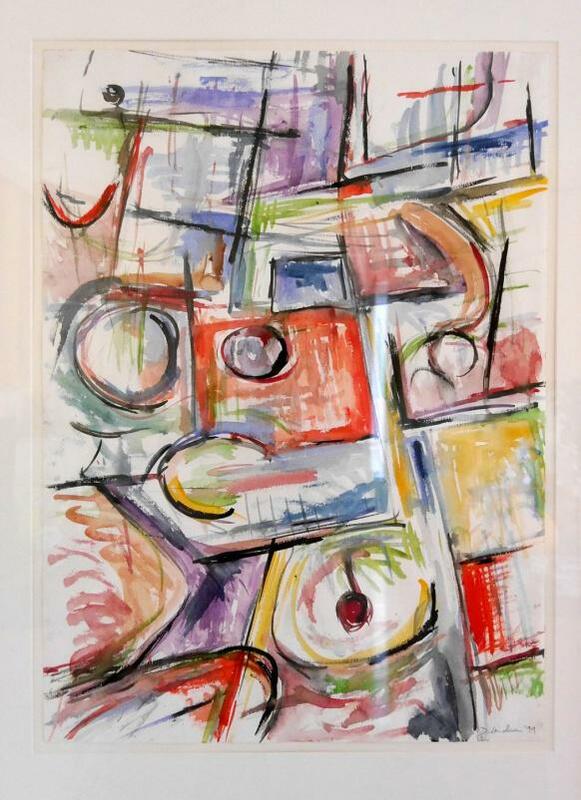 As an artist, I frame my own work on paper. 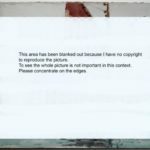 A frame is intended to protect the picture. However, as paper conservator, I have experienced that acid framing materials and certain practices can harm the work over time. I am often asked how I frame, which materials I use, and from where I purchase them. Therefore, this article contains tips on methods and materials that keep the artworks safe. To find those materials, a list of possible suppliers has been added. The list is not conclusive and you may find others of your choice. Needless to say, I have no personal interest in any of my recommendations and selections, and they are not meant to be advertisements.